In Bangalore, India, heart surgeons perform state-of-the-art heart surgery on adults and children every day, at an average cost of $1,800. For the record, that’s about 2% of the $90,000 that the average heart surgery costs in the United States. And when it comes to the quality of the heart surgery, Bangalore’s “patient outcomes” are among the best in the world. This story of high-quality and low-cost represents precisely the type of disruptive innovation that has impacted nearly all industries in the United States. Therefore, it should serve as a wake-up call for American doctors and hospitals. Disruption is what we call it when lower-priced alternatives to current products and services are introduced. In industry-after-industry, the incumbents in the field scoff at them and dismiss their long-term impact, only to be blindsided when, after a decade, new companies dominate. To date, doctors and hospitals have been spared the pain of disruption. But that day is ending, and the Trends Editors predict that even people looking for it to happen are gazing in the wrong direction. Most visionaries expect disruption to be led by companies resembling Google and Apple or maybe entrepreneurial start-ups. But, as we explained over 10 years ago, they should also be looking globally. Why? Because “best of breed” health care companies in emerging markets are dealing with markets resembling the toughest ones served in the OECD countries. For instance, most families in India have no health insurance, and often need to borrow the money to pay for surgery. When it costs $1,800 for heart surgery, an Indian hospital can offer it to only so many children. But, if they can get it to cost less, they can save more lives. Bangalore’s best of breed hospitals, like Narayana Health, are driven to transform health care to save lives. On a typical day, Narayana’s teams of surgeons perform an average of 37 heart surgeries on adults and children, including one heart transplant. That translates into about 900 procedures a month, or about what a U.S. university hospital does in a year. Narayana’s success results from a combination of high volume, advanced technology and a focus on people and performance. In surgery, the experience level of the surgeon and his team are the best predictors of superior clinical outcomes. As you might imagine, given the huge volume of procedures they perform each day, Narayana’s results are exceptional. And contrary to what Americans may assume, the entire surgical experience is cutting edge, and beyond what is available almost anywhere in the United States. For example, clinicians use a sophisticated “electronic health record,” or EHR, they developed; the information is stored on an iPad. Unlike nearly all U.S. EHR systems, the application is so intuitive that minimal physician or nurse training is required. The operating rooms themselves have huge windows leading to protected gardens designed to allow natural sunlight to enter and stimulate creativity. The bedside monitoring equipment links with a central computer system, allowing clinical leaders like to measure how long it takes a physician to intervene for a potentially urgent medical problem, on any given day. At night or on the weekend, response time often exceeds one hour, in the United States. At Narayana it averages just eight minutes! That means the disruptive innovation they have implemented isn’t just delivering lower cost, it’s also delivering higher quality. Narayana’s research facility matches the best university hospitals in the United States., with tens of thousands of fully sequenced DNA specimens as well as a place to store cancer tissue from each day’s procedures, to be tested against the discoveries of tomorrow. Unlike many U.S. research facilities, Narayana’s is fully integrated with the clinical practice, focusing on the questions and opportunities raised by the treating physicians. Next door is a lab focused on nanotechnology, and down the hall, is one working on a vaccine to prevent heart attacks. So, what if you could provide excellent care at ultra-low prices at a location close to a U.S. population center, like Miami? That’s what Narayana Health did in 2014 by opening a hospital in the Cayman Islands, called Health City Cayman Islands (or HCCI). It was intentionally designed to be close to America, but outside its regulatory restrictions. Narayana Health brought innovative practices honed in India to HCCI to offer first-rate care for 25–40% of U.S. prices. 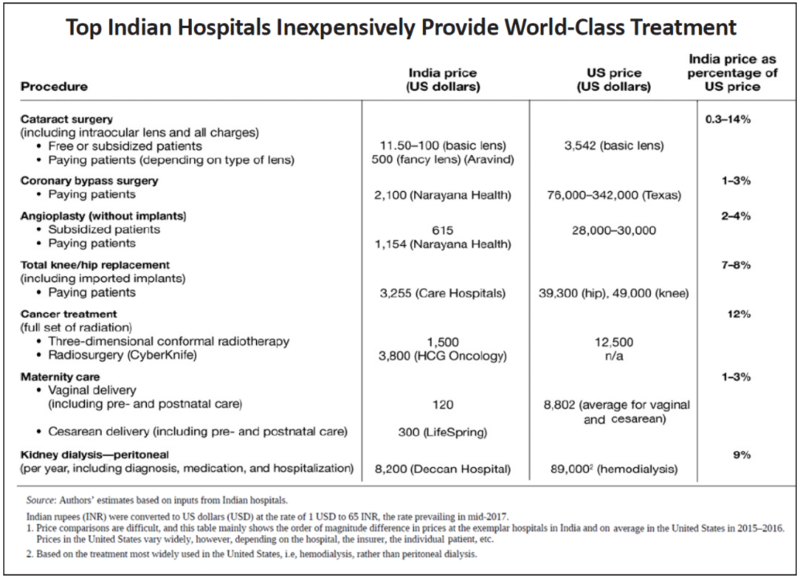 Obviously, this is not as cheap as Narayana’s services in India, where prices are 2–5% of U.S. prices, but HCCI’s prices are still a whopping 60–75% cheaper than U.S. prices, and even at those prices it is expected to be extremely profitable as patient volume picks up. Already, at three years after its launch, HCCI had seen about 30,000 outpatients and over 3,500 inpatients. It had performed almost 2,000 procedures, including 759 cath-lab procedures. What about quality and outcomes, the true measure of value-based care? HCCI’s outcomes have been excellent with a mortality rate of zero. The hospital was built at a cost of $700,000 per bed, versus $2 million per bed in the U.S. Its buildings have large windows to take advantage of natural light and ventilation, saving on air-conditioning costs. It also has open-bay intensive care units, which optimize physical space and require fewer nurses to be on duty. Narayana Health leveraged relationships with its suppliers in India, where it enjoyed lower prices because of volume discounts, to get similar advantages at HCCI. For instance, all FDA approved medicines are purchased at one-tenth the cost for the same medicines in the U.S. Similarly, HCCI can buy equipment for one-third or one-half as much as it costs in the U.S.
HCCI outsourced back-office operations — including human resources, accounting, finance, medical transcription, and radiology — to low-cost, but highly skilled employees in India. HCCI also reduced costs through intelligent make-versus-buy decisions. For example, HCCI makes its own medical oxygen rather than importing it from the U.S. at high cost. Similarly, HCCI saves 40% on energy costs by using its own 1.2-megawatt on-site solar farm; this makes perfect sense in extremely sunny places like Bangalore or Grand Cayman. U.S. insurers and employers have watched HCCI with interest, but so far HCCI is not one of the options available to their patients. 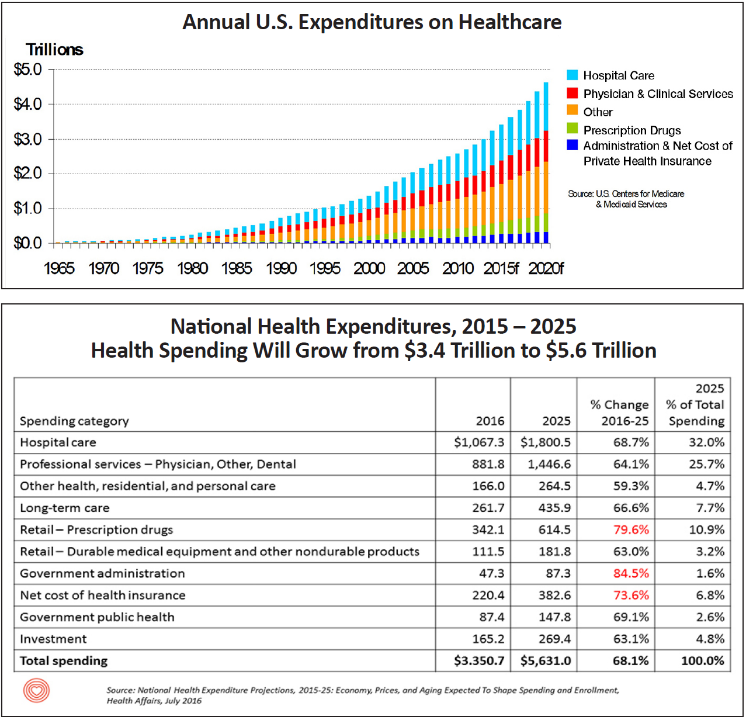 But this is bound to change, especially as HCCI builds a track record and U.S health care costs continue to soar. Why? Because U.S. insurers could save a lot of money by using HCCI, even if they offered zero copays, zero deductibles and free travel and accommodations for the patient and a companion for a 1-to-2 week stay in the Cayman Islands. 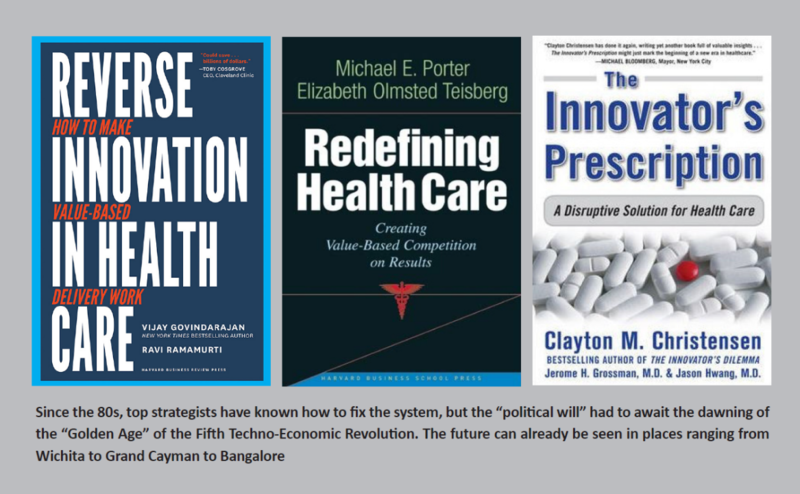 First, by 2025, dramatic policy changes favoring “value-based medicine” will unleash a wave of creative destruction, pivoting-off of “tort reform” and “a revitalized” FDA. Healthcare for an aging population is the biggest single economic challenge facing the United States in the next 30 years. Without changes to policies, methods, or demographics the system is unsustainable. Just as we’ve seen with the EPA, the current administration is “not afraid to slaughter sacred cows.” Legislating tort reform will eliminate hundreds of billions of dollars a year spent on practicing “defensive medicine” and settling frivolous claims. Mandating data-driven regulatory mechanisms will lead to better products and methods getting to market more quickly, at lower costs. Remember, the current regulatory paradigm was designed for the mass production era, it won’t work when therapies are created for the benefit of tiny population segments or even individuals. For non-catastrophic illnesses, policies will favor replacing medical insurance with comprehensive health programs in which one fee covers all services. By disintermediating 3rd party payors, this will give consumers a greater incentive to demand value in health care. America’s best example of this model is Wichita-based AtlasMD, which drives down health care costs by providing direct primary care at a fixed rate. At Atlas, patients pay a membership fee, ranging from $10-to-$100 per month. Members have access to doctors in-person, by phone or through social media channels. Patients don’t pay co-pays and aren’t charged extra for office visits. Medications typically cost “pennies on the pill.” And X-rays, including radiology reads, cost an Atlas member $20-to-$40 versus $500-to-$1,000 through a hospital emergency room. For catastrophic events, most AtlasMD members still carry low-cost, high-deductible health insurance. Third, by 2025 new U.S. facilities will begin to embrace the cost saving business practices proven elsewhere by companies like HCCI. Fourth, by 2025, the United States will leverage trade policies to dramatically lower American drug costs without destroying incentives for innovation. The answer is to stop allowing foreign countries to evade our patent laws and impose their own price controls. Wealthy members of the OECD have long enjoyed the fruits of American-funded progress “on the cheap,” thanks to state-sponsored price controls. That means American consumers are the “suckers” who have to pick up the cost of underwriting the critical research and development investments. A study from NIH calculated that if OECD countries lifted all price controls on prescription drugs, the resulting increase in pharmaceutical R&D investment would yield eight-to-thirteen new drugs per year through 2030. Fortunately, Trump recently pledged to fight to reverse these violations of American intellectual property in upcoming trade negotiations. He denounced “foreign freeloaders” and has directed his trade representative to “make fixing this “injustice” a top priority” in negotiations with every trading partner.